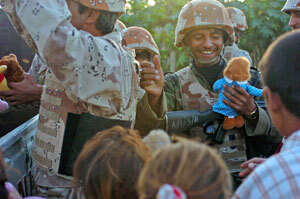 The grin on the Iraqi soldier’s face widened as a little girl ran back to her house holding up a new stuffed animal and showing it to her parents… Children smiling and parading off with their new toys was a common sight as Iraqi soldiers took a break from their normal duties recently to pass out toys. Stopping in the village of Mukashyfa, near Samarrah, the soldiers not only cheered local children, they positively affected the opinion Iraqi adults have of their nation’s troops. Operation Toy Drop included several stops where the Iraqi soldiers often found themselves surrounded by the local children. In all, an estimated 250 kids received gifts brought by soldiers, more than four truckloads of toys that were donated by families in the United States. The troops also enjoyed the operation. Stovall said the operation served two purposes.